The Togian Islands are located in Sulawesi's large, sheltered bay of Tomini. The archipelago consists of three main volcanic islands and a number of smaller ones, it is the only place in the world where barrier reefs, atolls and fringing reef can all be found together. There are pristine coral gardens and even the odd wreck to dive in this wide calm bay. Diving at Banggai can be a little trickier but is no less rewarding. Around the island of Una Una there are huge corals, sponges, seafans and abundant fishlife wich schools of jacks, snapper and fusiliers. The Pinnacle drops to over 60 meters and also has some large sponges and coral formations, also amazing abuundance of fish at this spectacular dive site. There is a patch reef at Apollo where large schools of barracuda congregate, along with myriad other species. 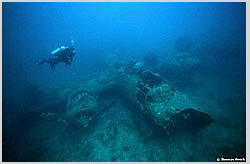 The wreck of a B24 Bomber lies in around 20 meters of water in good condition with propeller and machine guns in tact. The Liberator went down in 1945 following engine failure and now forms the home of a wide range of marine creatures. Dominique Rock is a deep dive that drops way beyond recreational limits. Plenty of healthy coral cover with groupers, rays and schooling fish all in abundance. The Crack is a canyon which leads to a large split rock, sharks are often observed here. Batu Gila is an impressive pelagic dive with a ridge at around 30 meters, there may also be hammerhead sharks and bluefin marlin off over the ridge and into the deep. 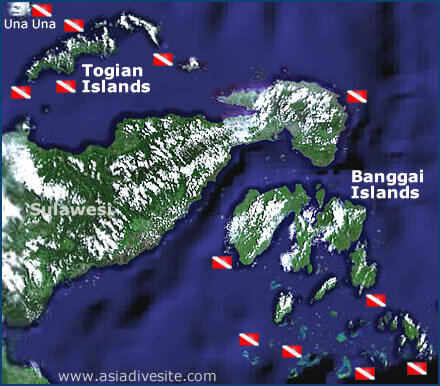 This island group around the peninsular in central Sulawesi is home to the endemic Banggai cardinalfish. There are stunning reefs, walls and overhangs here all teeming with marine life. Currents can be slightly stronger than diving in the Bay and some of the walls here drop to over 100 meters. George's Wall on a huge offshore reef south of Banggai is an impressive dive with great coral cover and plenty of fish including batfish, surgeonfish and reef sharks. The sloping reefs at Kebun Laut and Kokunan Bay are also stunning in terms of life and biodiversity. Lost Anchor is a pinnacle that breaks the surface and is home to swirling schools of fish below it and two more pinnacles at Batu Gong attract the same attention.